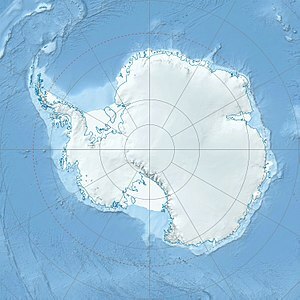 González Videla Base, is on the Antarctic mainland at Waterboat Point in Paradise Bay. It is named after Chilean President Gabriel González Videla, who in the 1940s became the first chief of state of any nation to visit Antarctica. The station was active from 1951–58, and was reopened briefly in the early 1980s. Occasional summer visits are made by Chilean parties and tourists. On the north edge of the station there is a sign identifying Waterboat Point as an official historic site under the Antarctic Treaty. This was the place where the smallest ever wintering-over party (two men) spent a year and a day in 1921-1922. The two men, Thomas Bagshawe and M.C. Lester, had been part of the British Imperial Expedition, but their particular project, which involved flying a number of aircraft to the South Pole, was aborted. Nevertheless, they decided to stay over for the winter and made their shelter in an old whaling boat they found on this site. Their time was not wasted, however, because Bagshawe wrote the first scientific study of penguin breeding development. Today the Gentoo penguins, probably descendants of the ones he studied, nest in the ruins of the whaleboat shelter. Antarctica. Sydney: Reader's Digest, 1985, pp. 230–231. Stewart, Andrew, Antarctica: An Encyclopedia. London: McFarland and Co., 1990 (2 volumes), pp. 394, 1080. Wikimedia Commons has media related to Gabriel González Videla Station.